There is a saying that goes, ‘Education is the key to unlocking doors for a brighter future’. 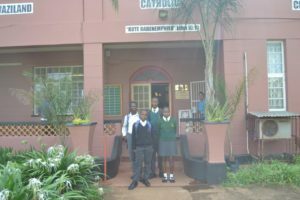 This is true for hundreds of Swazi students from all four regions of the country that assemble at the Catholic Centre (Caritas offices) every second week of January to apply for funds to pay for their education. In truth, some even started visiting our offices as early as December 2017 to record their requests; ‘We wish to see the Bishop in order to register our request for school bursaries as we do not have any income to pay for ourselves; they would say (some with tears in their eyes). Due to the nature of the exercise and the huge numbers that flock to Caritas offices, the Bishop of Manzini every year assigns Caritas the task of screening all the applicants. Therefore, this means that some applicants do not make the list of selected beneficiaries because they do not fulfil the criteria to benefit from the bursary fund. This year (2018), a total of 660 candidates applied for the bursary fund. Of this number, 265 have been selected to benefit from it.